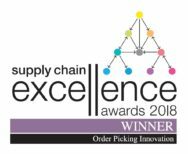 Voiteq, global providers of voice-directed work solutions, has been named as the Supply Chain Excellence Awards’ Order Picking Innovation Winner 2018, in conjunction with its customer Crown Paints. Judges heard how retailers are continuously challenging manufacturers of consumer goods to make more frequent, smaller deliveries. This has led to an increased proportion of case picks and mixed pallets in the manufacturers’ warehouse. By working in partnership with Voiteq to utilise voice along with volumetric and weight information, Crown Paints – now part of a world-leading coating specialist, Hempel –saw an opportunity to provide its customers with the ‘perfect pallet’ that would ultimately improve their productivity and efficiency. Voiteq delivered an initial 8-week VoiceMan Warehouse Execution System (WES) pilot which used data to automate and voice-direct operatives in the warehouse, through an optimised pallet-building process. 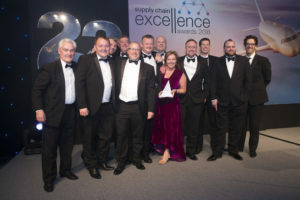 Setting the benchmark for supply chain best practice, logistics and supply chain professionals gathered at the annual Supply Chain Excellence Awards, now in its 22nd year on November 6th at London’s Hilton Park Lane Hotel. Winners from each of the nineteen categories were presented with their awards by BBC comedian and actor Marcus Brigstocke. The awards have become the benchmark for supply chain best practice.